In 1949, Avalon, NJ was a sleepy sea-side town without much more than a bar, a hotel and a real estate office. When Mr. & Mrs. Kohler decided to open a bakery in such a small community, there were those that scoffed at the idea. Well, the naysayers were quickly proved wrong. The Kohler’s sold out their very first weekend! After that it didn’t take long for the word to spread about the new bakery in town that was serving up delicious homemade buns and donuts. The Kohler’s retired after seventeen years and sold the business to Mr. Kohler’s young apprentice and his wife, Bernie & Marcia Bischoff. The Bischoffs originally planned to own the business for five years. Twenty-five years later, they decided it was time to retire. At a weak moment in 1995, Mary’s sister Christina decided that getting up at 3am might not be so bad and signed up to be Mary’s new partner. 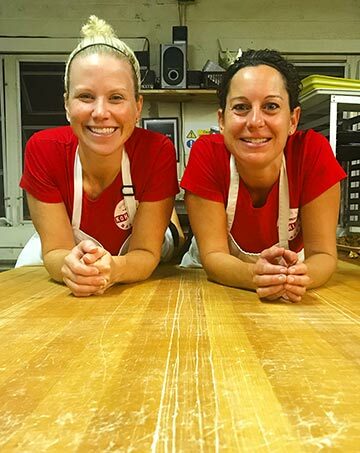 This brings us to this year, where we find the fourth generation of owners, Katie Crompton and Colleen Quinn-Maxwell. These two friends have worked side by side for over 20 years in the bakery, and now continue Kohler’s long tradition of excellence. Katie Crompton grew up in Bucks County, PA and has always loved spending time in Avalon. She would enjoy stopping at Kohler’s with her family to get some “crumb buns,” not realizing that someday she would own the business! As it turned out, she started working at the bakery at age 16 for her cousins, Mary and Christina McNamara. Kate was happy to be part of the “Best Buns in the Sun” crew. After graduating from Messiah College with a BA, her dream of having her own business came true with the retirement of her mentor cousins. She was thrilled to be the new and 4th in line of Kohler’s owners with friend Colleen. Katie is married to Greg, and has two step-sons, and a son and a daughter. She works in the off-season at an accounting firm. As a lifelong resident of Avalon, Colleen’s ties to Kohler’s Bakery extend further back than just her enjoyment of their cream donuts when she was just a little girl. During the summer of 1952, her grandparents rented the apartment above the old bakery and hardly a day went by that “buns” didn’t grace the family’s table that year or any subsequent year. Following in her brother Chris’ path of being the Inquirer paper boy in front of Kohler’s, then moving into the bakery as a baker’s assistant, Colleen, at age eleven, was the “paper girl” for several years before becoming a Kohler’s “store girl” for twelve years. Now, as a co-owner in the business, she intends to continue to bake up Kohler’s traditional recipes so that Avalon’s families of today can share in its history. Colleen currently teaches High School Health and Physical Education in Pennsylvania and is also a certified athletic trainer. She is married to Jon and has two sons. 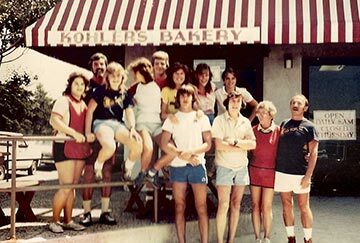 And that brings us to today…Kohler’s Bakery has been in business for over 70 years. Although a few new products have been added and a new building replaced the original in 1980, the recipes, baking methods and friendly service have not changed and you can still find customers waiting in line on the corner of 27th & Dune Drive for the cinnamon buns and cream donuts that they remember from their childhood. Why not visit our store? Or if you’re too far away, take a look at our product list and order some buns today!